Once known as the Great Andromeda Nebula, M31 is the dominant galaxy in the Local Group of galaxies that includes our own Milky Way galaxy. 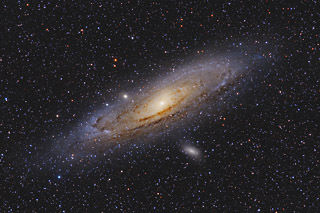 Typical of large spiral galaxies, M31 is believed to contain on the order of a trillion stars. The galaxy also shows beautiful red HII regions along the spiral arms. At a comparatively close 2.5 million light years, the galaxy has the distinction of being the very farthest object we Earthlings can see with our naked eyes. At magnitude 3.4, the galaxy is easily visible from even modestly light polluted skies. M31 has two dwarf elliptical satellite galaxies that are easily visible in this image. M32 is the small fuzzy patch just above the main galaxy, while M110 is the larger galaxy just below M31. In this image, North is to the right. Software Used Images Plus 5.75 for camera control. Images Plus 6.0 for calibration, stacking, digital development, feature mask, star shrinking and halo reduction, smoothing and noise reduction. Photoshop CS5 used for levels and curves, hue and saturation colorizing and adjustments, lens correction, cropping and selective color. Pixinsight 1.8 for additional stretching. HLVG for additional color correction, Gradient Xterminator for gradient removal. Carboni Tools for additional noise reduction and smoothing, Focus Magic for focus restoration. Registar for stack alignment. 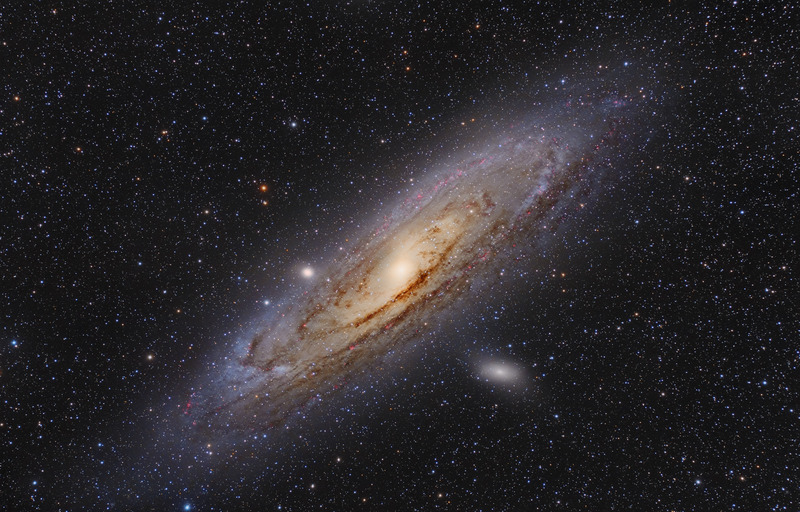 Notes I had imaged M31 in September 2013 using my Canon 200mm lens and my Canon 450D camera. I was very happy with that image, but I thought it would be interesting to capture this beautiful galaxy with the better resolution of the 600mm Nikon lens and the Canon 6D camera. Actually, I was so happy with my earlier version of this image that I ended up using that image for the RGB color in this image. As a result, the two images look very similar. However, when viewing the high resolution versions, its easy to see that this image has dramatically better resolution (2.2 arcseconds/pixel versus 5.5 arcsec/pixel). I also added Ha data to this version, so it shows the HII regions very well. Using different processes also gave me better contrast in this version. All in all, I'm much happier with this updated result. This image won first place in Astrophotogallery.org's Hard-Galaxy category for November 2014. This image was also selected for Astronomy Magazine's Picture of the Day for October 22, 2015! Then, Astronomy Magazine chose it AGAIN for it's Picture of the Day for August 2, 2016!